In the summer, we kick-back a bit and do things at a more relaxed pace. In that spirit, my daughter and I decided to do some fancy sugar cookie decorating. Inspired by the July issue of Martha Stewart Living, we tried our hand at marbled frosting. (suggestion from Barb, the Cookie Queen). draw concentric circles (starting w/ a dot) or arcs. - either all one direction, or in alternating directions. 3) Let dry and enjoy! 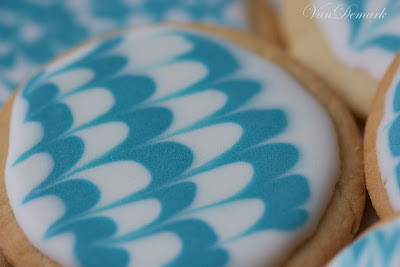 You can see my Valentine's cookies here. Wow, I love these! They look like "Anna" cookies can only look...too beautiful to eat! WOW!!!! Absolutely fantastic=) Have a lovely day!! wow! so amazing and creative! so pretty and almost too dainty to eat, but who can resist a cookie, I know I can't, yum! so lovely to have found you! stopping by from the creative exchange. Cookie art! 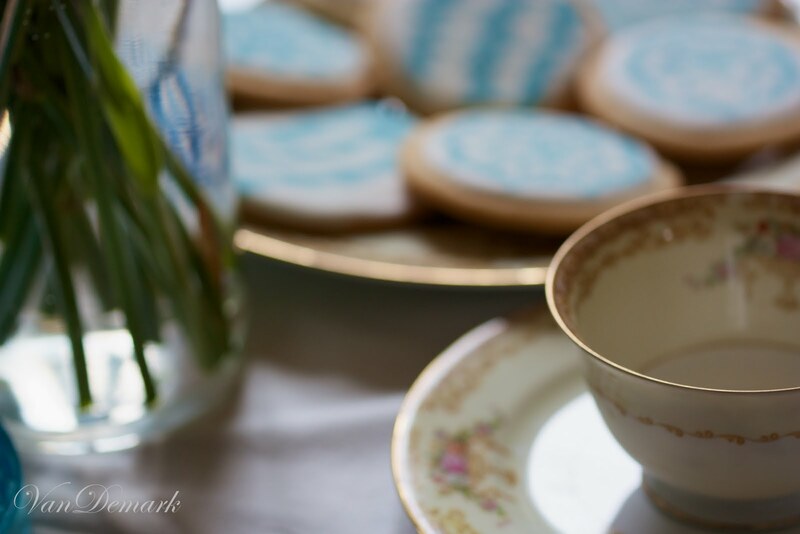 They look so very pretty - perfect for afternoon tea :-) I love the delicate pattern of your china ware too. Those look great - and very professional. Anna, these are amazing!! They are truly too pretty to eat (but I am sure I would find a way!) Really beautiful work! Thank you so much for sharing these wonderful photographs today at The Creative Exchange. I have to agree with the rest here, they look to good to eat for sure.. but I am sure they are ever so tasty.. will have to give this a try.. have a beautiful day.. I agree, too - much too beautiful to eat, but I bet they taste as delicious as they look! Those are too beautiful to eat...but, they look soooooo yummy! 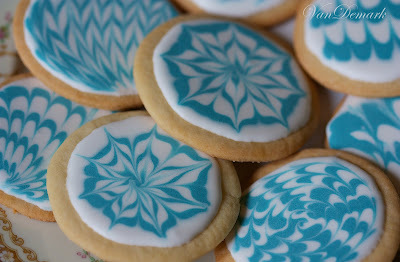 These are like cookie art ... and so wanting to eat them! These are amazing little works of art! So so beautiful! amazing work! I bet those cookies taste as good as they look! Wow! I think I need one of those today!! Someday I must try that!! just so artistic.. i relish the blue you used ...those would not last long at my house!! Love the designs and color in these ... little works of art! I saw her do that on the Today Show. Yours turned out beautifully! 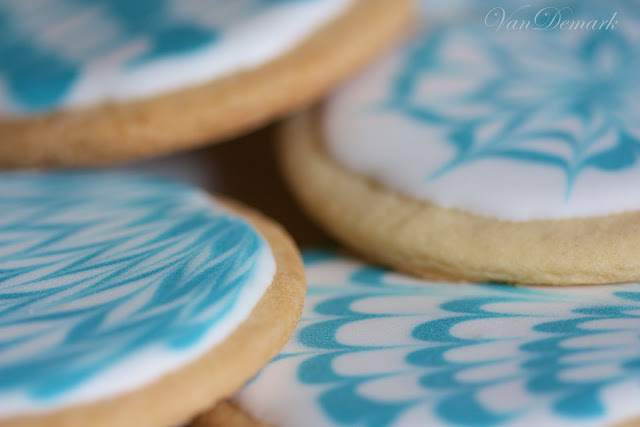 Each cookie is a work of art! Tea time? Your cookies are super impressive! I really love your heart cookies! Pretty! So detailed! WOW! I'm truly impressed with the 'art' you've created on these simple cookies. Really nice!!! So beautiful! Move over, Martha Stewart. I really love the way you captured these day lilies.. their softness overflows.. beautiful.. I did a search through my comments to find you, and after all that I realized I could find you at Inspiration Studio! it was worth it. I apologize for not coming round. don't have any excuses either. 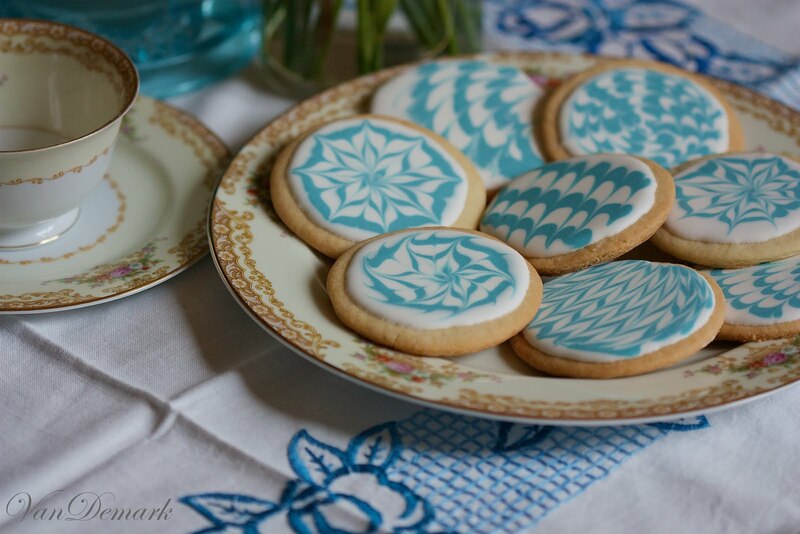 these cookies are too beautiful to eat. Weren't you happy after creating these? I wish you were my next door neighbor, I'd be over in a flash. how are you faring with this heat? has it gone to the northern reaches of Wisconsin? I hope you're having a joyful week Anna. stay cool, stay light. Yum, those are luscious-looking. And the photos could be in Martha's magazine easily. I am so going to have to show my daughters asap as well. They love baking and are much more talented with the decorating part of it than I am. Yours look like art. Truly. What a beautiful post - everything looks so royal (I like Tammy's word). Thanks for linking up with the muses. Those look amazing! So fancy, I love it! Gorgeous Anna, love the first shot with the beautiful tea cup. These cookies are gorgeous, aren't you clever!